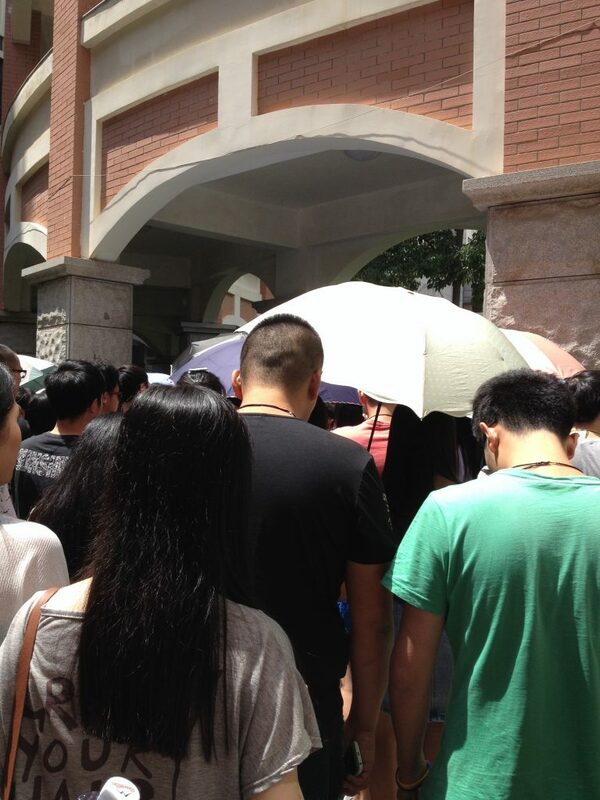 Lunch Time on a Chinese Campus – Writer. Traveler. Tea Drinker. Just one of the seven (interconnected) buildings emptying at the lunch bell. If you’ve lived in China for any length of time, you know how important lunch is. No squished sandwich eaten at your desk, or some long ladies luncheon. Lunch is fast and quick for the main event: the afternoon nap. At a college campus lunch is like a flash flood. People start trickling into restaurants around 11. Order come from online apps, soon after, to be delivered at the dorms. The phone starts ringing with more orders until the school bells ring out across the campus. Then comes the flood waters. When a campus has classrooms spread throughout it’s not a problem. Sure, it’s crowded, but you can still walk around and students disperse to several cafeteria and off-campus shops locations. But I started to teach at a new department and lunch is insane. The classroom building I teach at is attached to all the other classroom buildings. There are about seven “buildings” which are actually just one building connected by corridors. 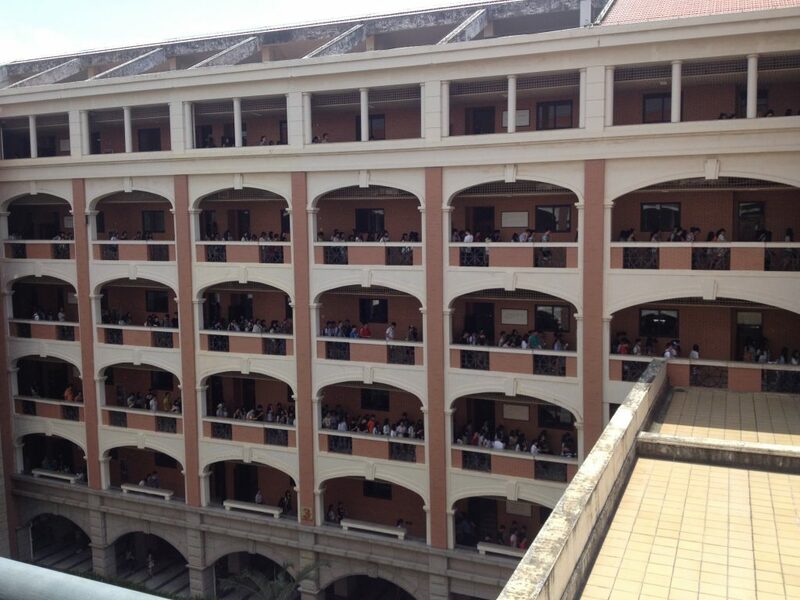 And all the students in this part of the school attend class in these buildings. About 20,000 students. Sure, not every student has class the period before lunch, but enough do to make just getting out of the building an ordeal. At best, it’s a slow shuffle to the street. At worst, it’s standing still among thousands of hungry students trying to get out. And you can’t even kinda sneak around people because of tall spikey bushes. It’s wall-to-wall with students packing the corridor. It’s like Thanksgiving traffic jam every lunchtime. First I have to get out of the stairwell which can take awhile…. …Then I have to make my way to the entrance of the building. Walking this corridor can turn into a long endeavor. And when you finally get out of the building, everyone is headed the same direction so the road isn’t much better. Unfortunately the cafeteria and the off-campus restaurants are all in the same direction. So we all continue our shuffle down the road together, only now, bikes and motor scooters have joined the fray. 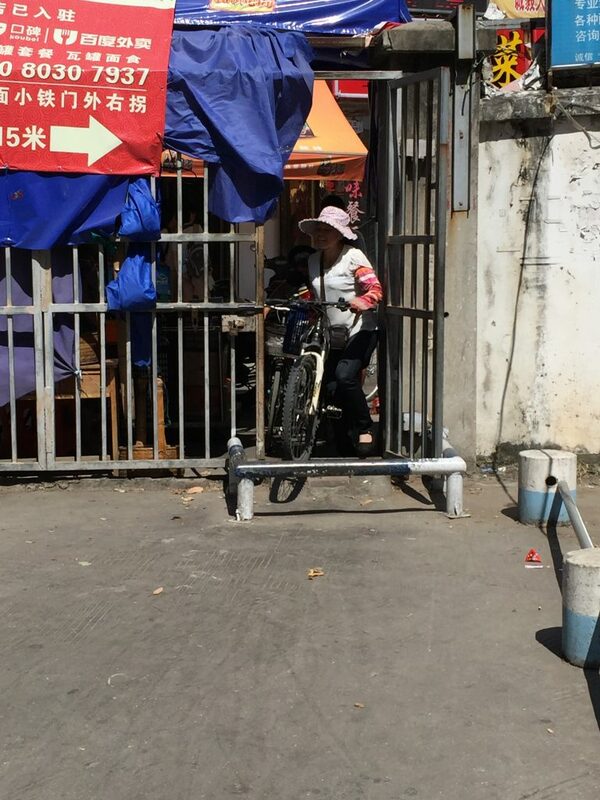 The first exit gate is for a small food street. That street has cheap and delicious food and I wanna go there, but the place is packed and all the restaurants are filled with students. You have to wait in line to even exit the small gate, which fits about two-people at a time. Instead, I continue on with the masses to the main cafeteria, then I veer off. There is another, smaller gate which also goes out to the food street, only the other end. There are less places, but they are less crowded. Its a good solution except the gate is teeny, tiny. Only one person can go through at a time and people are trying to both enter and exit the gate, and bike guys doing deliveries have to carry their bikes across. And if it is raining, and everyone has an umbrella (which is too wide for the gate door) things get ugly. I can be standing there for five minutes before I finally push my way through. This is the little gate I use. I took the picture at a non-busy time. Once I get my food and re-enter the teeny gate, the challenge still isn’t over. I gotta make it back home without being hit by a biker. Ordering food to go is incredibly easy, and things are delivered to the students via bikes. And they are just as rushed as everyone else to deliver the food and get back for more. There are probably more than 100 of these guys riding around like lunatics. It’s best to stay out of their way. Delivery guys load up and hit the campus, delivering dozens of meals on their bikes. The two tiny gates get so busy (and carrying a bike over the threshold such a pain) that some clever bosses have found faster ways to get the food to the delivery guys. All they need is a ladder to scale the school walls. It doesn’t last long though. Within 30 minutes, even the slowest restaurant has served all their food, and students are gone. They have two-hours for lunch, so the sooner they finish, the sooner they can sleep. You think that after the rush would be a perfect time to go out. But actually most workers take a nap too, and if you want something you have to wake them up or walk around looking for the owner (who went somewhere else to take a nap.) Some restaurants close at 12:30 and won’t reopen till dinner time. It’s always best to not wait too long to get your lunch. Wow. That’s insane. Thanks for the view into the campus, though. I shall not complain about LA traffic now. Or at least for a week.